Residents of Wake County, N.C. woke up to an eye-popping story in their Sunday paper that added several bizarre angles to the ongoing political drama over the local school system's diversity policy. The scandalous revelations may have implications for two Republican board members now running for higher office -- and for the big conservative donors supporting them despite what some political insiders say was widespread knowledge of the shenanigans. Last week The News & Observer newspaper of Raleigh, N.C. received a long-sought police report from an unknown source that revealed details of an investigation into a 2010 burglary at the home of Wake County Board of Education member Debra Goldman. Shockingly, it revealed that Goldman had named fellow Republican board member Chris Malone as a possible suspect for the felony crime. It also revealed that the two had an affair that began shortly after the 2009 election and that Goldman reportedly ended in early 2010 over Malone's objections. Goldman and Malone, who are both married to other people and have children, were part of a Republican school board majority that took power in 2009 with the financial and strategic help of conservative financier Art Pope and grassroots organizing support from the North Carolina chapter of the conservative advocacy group Americans for Prosperity, on whose national board Pope sits. The GOP-led school board immediately ended a nationally recognized desegregation policy that had long been the target of conservatives. But that decision led to an outpouring of public anger and organizing that resulted in voters returning Democrats to the majority in the 2011 election. Goldman, a former EMT and volunteer firefighter, is now running for state auditor, while Malone, a corporate security investigator, is seeking a state House seat. 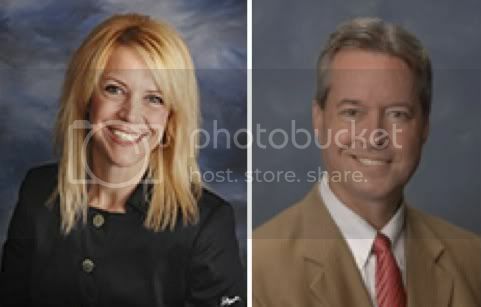 Both continue to serve on the Wake school board. According to the police report, Goldman reported a burglary of her home in June 2010 in which $100,000 in jewelry and $20,000 in cash was stolen from a "ratty pink backpack," along with $10,000 in coins taken from a suitcase. She told police she kept large amounts of cash at her home because "she found it very difficult to get money from her bank in order to pay her bills" after the terrorist attacks on Sept. 11, 2001. Police investigating the burglary asked Goldman for a list of potential suspects. She named Malone as well as a number of her political opponents. Among the reasons Goldman said she suspected Malone was that he had been having financial difficulties and soon after the burglary purchased a new vehicle. He acknowledged having money problems to police but said he resolved them by getting help from family. On Oct. 4, 2010, police told Goldman there wasn't enough evidence to press charges and said they were closing the case. The following day, Goldman broke with the board's Republican majority and voted against a new assignment proposal that scrapped busing for diversity in favor of neighborhood schools. Ron Margiotta, the Republican who chaired the board at the time and who lost his seat in last year's Democratic landslide, told The N&O that Goldman's action showed she "was trying to push back" against Malone and "show her independence." Margiotta also said it "seemed to be common knowledge" that Goldman and Malone were romantically involved and that political operatives in both parties knew about the allegations in the police report. Because of that, Margiotta professed surprise that they ran for higher office. But if it was "common knowledge" that Goldman and Malone were involved in an inappropriate relationship, that she had suspected him of burglarizing her home, and that two candidates running on platforms emphasizing fiscal responsibility had serious money management issues, it did not deter some high-profile Republican donors from supporting their political campaigns. * Claude E. Pope Jr. -- former chair of the Wake County GOP who led the party during its 2009 school board takeover for which Art Pope, his distant cousin, served as architect -- donated $100 in February 2012. * David Ruden, chair of the N.C. Sixth Congressional District Republican Executive Committee, contributed $110 in May 2012. That committee also donated $277.55 in in-kind contributions in June 2012, while the High Point Township Republicans contributed $1,000 on June 15, 2012. * The Committee to Elect Bill Daughtridge contributed $500 on May 4, 2012. Daughtridge, who runs an oil distribution firm, served three terms in the N.C. General Assembly and ran unsuccessfully for N.C. State Treasurer in 2008. Last year he became a senior advisor to Republican Speaker of the House Thom Tillis, whose office has been involved in its own scandal involving two high-level staffers who resigned after it was revealed they were involved in inappropriate relationships with lobbyists. Tillis later added to the controversy by authorizing severance payments for the staffers equal to a month's salary. * The N.C. Republican Party, chaired by former Congressman Robin Hayes, donated $2,500 in in-kind contributions for research to Malone's campaign on June 13, 2012. * Bob Luddy, a prominent conservative donor and close associate of Art Pope, contributed $2,000 on Jan. 6, 2012. The owner of a nonprofit chain of private schools in Wake County, N.C., Luddy was also the top contributor to the anti-diversity candidates in the 2009 school board election. Margiotta, the former school board chair who knew of the affair and burglary allegations, also served on the board of one of Luddy's private schools. * Kieran Shanahan, a major Republican donor and Raleigh attorney who has represented the Wake school board and the N.C. Republican Party, donated $1,000 on Jan. 3, 2012. Shanahan knew about Goldman's and Malone's affair and the burglary allegations, as The N&O reports that he called police "on Malone's behalf before recusing himself due to a conflict of interest because he represents Goldman on some matters." 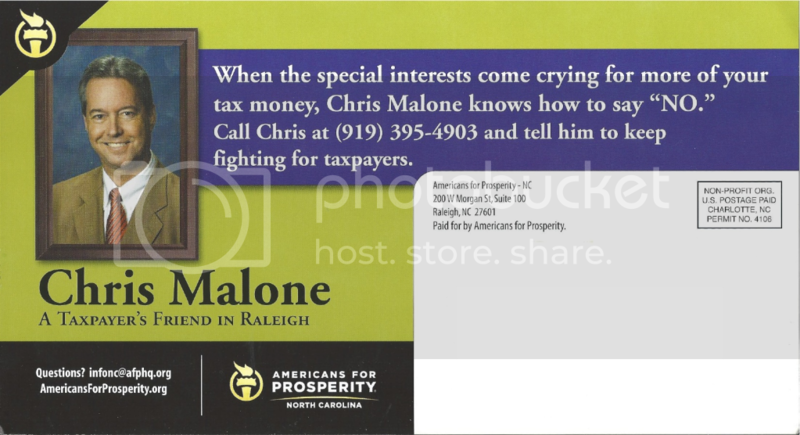 * Filings with the state election board also show that Americans for Prosperity reported spending $6,561.45 on direct mail in October 2012 (see mailer above; for a larger version click here) praising Malone for being "a taxpayer's friend in Raleigh." The consequences of the drama continue to unfold. Goldman dismissed the revelations as "politically motivated" and said she would continue her campaign to be auditor. Malone also said he would not drop out of his House race and has "moved past" what happened. State GOP chair Hayes issued a statement yesterday saying the party would continue to support all Republicans on the ballot, according to The N&O. But Goldman does not appear on the party's weekly schedule of joint campaign appearances by statewide candidates. In addition, her image was cropped from a photo on the Facebook campaign page of John Tedesco, another member of the board's GOP faction who is now running for state superintendent of public instruction.